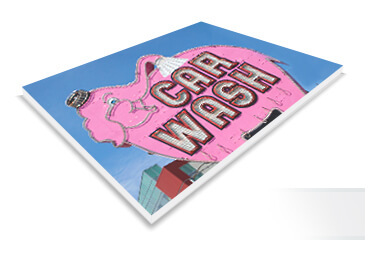 Our mounting substrates and laminates are not only used to protect your image from dust and moisture as well as faithfully holding your image in place without peeling or warping in a frame, they are also used to present artwork in a unique way. By offering exotic woods and metals together with breathtaking over-laminates, we can achieve endless effects to help inspire and carry your vision to the viewer. 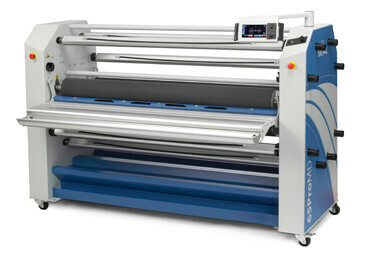 Scroll down to learn more about our mounting and laminating options. 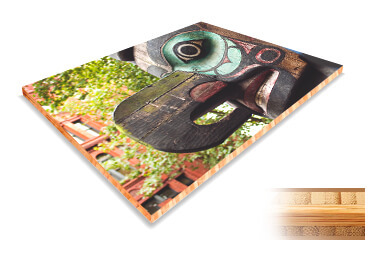 Our selection of substrates and laminates offers multiple choices considering weight, rigidity, price, and appearance. Learn more about each. DiBond is an aluminum sheet with a polyethylene core. This lends excellent rigidity and lightness without compromising the look of brushed aluminum (or brushed copper or bronze.) DiBond is stable, withstanding extremes in temperature and moisture. It is suitable for interior and exterior applications. Used in a ‘reveal’ application, it can add a clean industrial or modern feel to your images. Sintra is a PVC plastic sheet suitable for many of the things DiBond is for, with the benefit of being lighter still. If you are not relying on the metal look of DiBond in a ‘reveal,’ Sintra is an excellent consideration as an economical option. Thicknesses are 1/8”, 1/4” & 1/2" available in black and white. 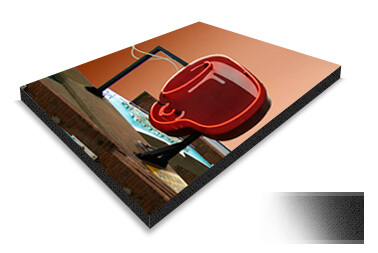 Foam core, also called foam board, is the most economical way to mount your images for a non-permanent setting. 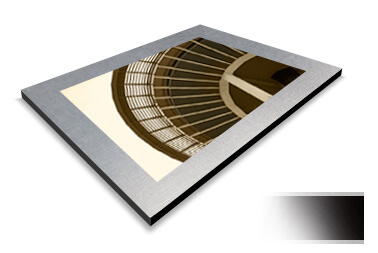 It is easy to cut, is flexible enough to pop into frames, and is lightweight. Available in 3/16” to 1/2”, white or black. For a longer installation, Gatorboard is an excellent option for mounting. Similar in look to Foamcore, it is much more stable over the long-term, resisting warping and moisture thanks to a resin-imbued wood fiber veneer. It is appropriate for long-term framing projects where overall weight is a consideration. Gatorboard is available in 3/16” to 1/2”, black or white. Much like the bamboo plant itself, this substrate is incredibly strong, but visually pleasing. This lovely wood is a nice choice for a ‘reveal’ situation, where your image might work well with natural warm wood. A ‘reveal’ of the bamboo texture on the edges can add a bit of modern wood flair as well. Available in most sizes. Please call for details. Basically, laminating an image is done in order to protect it, to seal it from moisture, dust, and abrasion. These days, a laminate can be used more artistically, to create a softness, a perceived tactile feel, or an extra gloss to your piece. 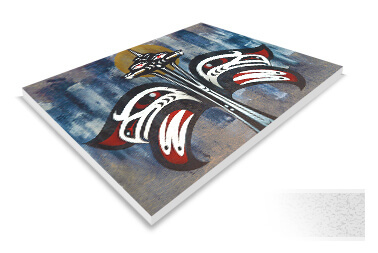 We even have a special velvet matte laminate that can be used in lieu of glass when framing. However, the basic principle is always there; to add longevity, protection from harmful UV and the occasional fingerprint. In addition to our main Matte, Lustre & Gloss over-laminates, we offer specialty laminating films such as Dry Erase, Matte Pebbled Texture, Soft Touch Velvet Matte, Anti-Graffiti, Polycarbonate and more.